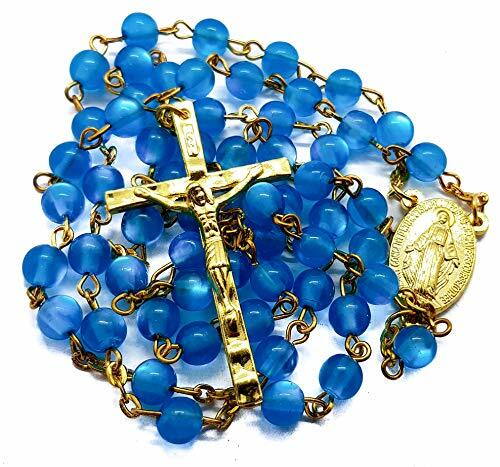 Light blue round crystal beads catholic rosary necklace with Miraculous medal and gold plated cross that hangs from a single row of beads made with most durable materials in supreme quality and craftsmanship. Devout 59 rosary beads beaded necklace fit most people comfortably and can be easily pulled over the head classic design perfect for everyday use. Spiritual jewelry beads designed and derived from Jerusalem Holy Land. Use as prayer rosary or fashionable necklace. Meaningful gift for any occasion, birthday, confirmation, first communion, baptism, friend and family member. Golden Catholic rosary necklace with light blue round cat eye crystal beads with Miraculous medal and gold plated cross that hangs from a single row of beads. Holy rosary necklace made with most durable materials in supreme quality and craftsmanship. Devout 59 rosary beads beaded necklace fit most people comfortably and can be easily pulled over the head classic design perfect for everyday use. Spiritual jewelry beads designed and derived from Jerusalem Holy Land. Use as prayer rosary or fashionable necklace. Meaningful gift for any occasion, birthday, confirmation, first communion, baptism, friend and family member. If you have any questions about this product by Nazareth Store, contact us by completing and submitting the form below. If you are looking for a specif part number, please include it with your message.